Despite the capricious wind conditions - with the 200 boats and over 1,500 sailors forced ashore on two days due to the strong winds- the 40th edition of the Régates Royales – Trophée Panerai will remain in the regatta’s history books as one of the most contested ever, with teams coming from all over the planet to grab the much longed for trophies. The eight winners crowned during the crowded prize-giving ceremony are: Moonbeam of Fife (Big Boats), Elena of London (Schooners), Kelpie (Aurique), Argos (Classics), Resolute Salmon (Classic Racer), Cippino (Marconi > 15 m), Fjord III (Marconi < 15 m) and Vanessa (Spirit of Tradition). A soft, gentle breeze accompanied the classic yachts gathered in Cannes for the closing day of the 40th Régates Royales – Trophée Panerai. In spite of a light southerly, not exceeding 5 knots, that forced the organisers to shorten the course, set between Cannes, Cannes, Mandelieu and the point of l’Esquillon, the elegant boats sailing in slow motion made for a great show for the many spectators taking advantage of the warm, sunny early autumn day on the Cote d’Azur. Two first and a third enabled the huge Elena of London to be crowned 2018 winner in the Schooner division, with Naemaand Mariette completing the podium. Despite scoring a fourth on Sunday, Moonbeam of Fife maintained the top spot among the Big Boats thanks to a better partial score (2 wins) leading Mariska and Moonbeam IV. 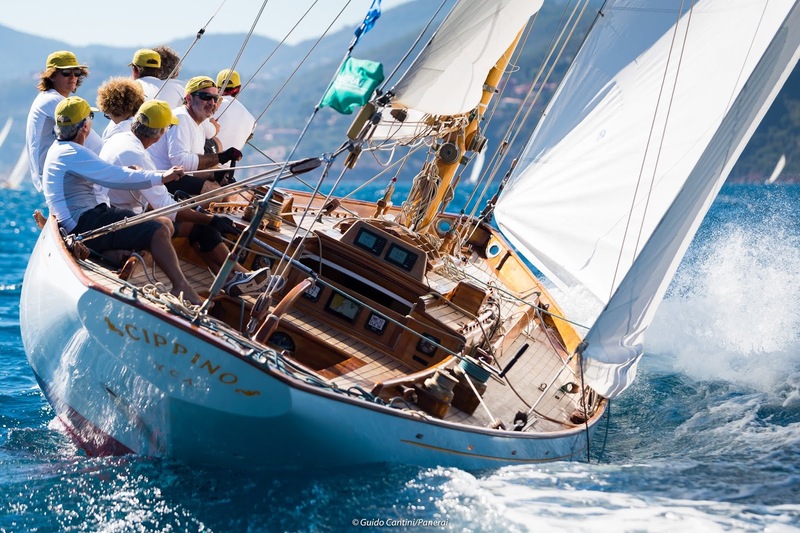 In the gaff cutter division, Alfred Mylne’s designed Kelpie showed great consistency -one win and two thirds- to advance Kismet and Viola, celebrating her 110th anniversary in Cannes with a podium spot. The Classics’ podium remained an almost all Spanish affair with Eduardo Mendez’s Argos and Pepe Negrete’s Yaniraprevailing on local skipper Philippe Monnet on Lys. Italian crew on Resolute Salmon kept their focus to finish second on the last race, whilst early leaders Sagittarius couldn’t do better than a seventh and slipped back to second overall, with the last win going to French 12m I.R. France. Argentina’s Cippino was the undisputed leader of the Marconi >15 metres class, finishing 5 points ahead of Wendy Schmidt’s Santana from the USA and 14 points ahead of Blitzen, whose crew comprised popstar Simon Le Bon and offshore female sailor Abby Ehler. Famous Argentinean designer German Frers led his to victory in the Marconi Arrow in second and France’s Ellad in third. And finally Patrizio Bertelli’s Vanessa, with Olympic, offshore and America’s Cup star Torben Grael at the helm, got her first title after being recently relaunched, leading Italy’s Freya and Switzerland’s Scherzo in second and third respectively.